In this view staged for the camera, Chief Commissar of the First Belorussian Front Lieutenant General Konstantin F. Telegin (November 3, 1899 - November 16, 1981), 8th Guards Army Commander Colonel General Vasily I. Chuikov (February 12, 1900 – March 18, 1982) Marshal of the Artillery Colonel General Vasily I. Kazakov (July 18, 1898 - May 25, 1968) observe the bombardment of the Seelow Heights on the first day of battle, April 16, 1945. Under First Belorussian Front Commander Marshal of the Soviet Union Georgy K. Zhukov (December 1, 1896 - June 18, 1974) 7-8,000 field guns of 47 mm (1.85 inch) or higher were coordinated by Colonel General Kazakov. Zhukov told United States Army General Dwight D. Eisenhower that he had assembled 20,000 guns, but that is probably an exaggeration. Some sources claim 40,000 guns, but that probably counts mortars and weapons smaller than 47 mm. Kazakov specialized in the double rolling barrage, where curtains of fire would descend on a fixed position from two directions, close to the advancing Red Army infantry. At the Battle of Seelow Heights, the Red Army barrage began at night to maximize surprise, but the Germans had anticipated the attack and withdrawn their defenders from the first line of trenches just before the Soviet artillery would have obliterated them. The attack turned into a quagmire as the German artillery, about 1,400 guns, counterattacked as the First Belorussian Front advanced. Zhukov was bogged down while Marshal Ivan S. Konev's First Ukranian Front advanced quickly through Halbe to march on Berlin. 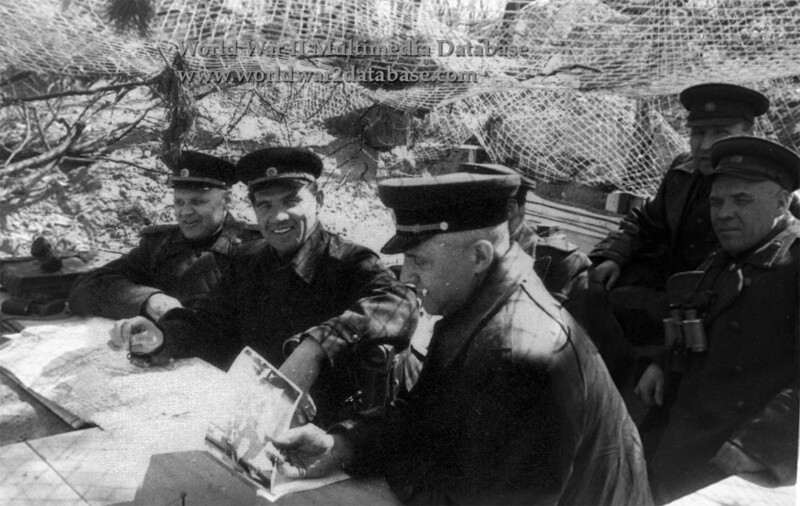 Zhukov committed his reserves and took the Heights with heavy casualties on April 19. First Belorussian Front was 90 kilometers (56 miles) from Berlin. By April 20, four days after this photo was taken and Hitler's fifty-sixth birthday, Soviet artillery was in position to shell Berlin. Berlin was encircled on April 23.